If a world full of boring econoboxes, monster-sized trucks and bland SUVs, it’s hard to stand out from the sea of sameness, especially when you’re on a budget. It’s a good thing then, that the Jeep brand exists. For over 75 years, Jeep has been helping American get out there and find adventure, with rugged, no-nonsense off-roaders that perform as good as they look. To that long list of great Jeeps, add another: the 2018 Jeep Renegade. Sleek and stylish, aggressive and modern, with interior comfort and modern exterior design that you might not expect from a vehicle that starts well under $30,000. If you’re thinking you might want to buy a 2018 Jeep Renegade for sale near Rogers, Arkansas, stop in today at McLarty Daniel Chrysler Dodge Jeep Ram Fiat in Springdale, talk to one of our friendly sales associates, and learn how you can own this incredible vehicle from Jeep! RUGGED, PURPOSEFUL DESIGN: From any angle, in any trim level, the new 2018 Jeep Renegade looks both modern and classic, playing up its groundbreaking design while never forgetting Jeep’s long, long history of rugged design and unstoppable off-road capability. Up front, the 2018 Jeep Renegade flies its DNA loud and proud, with the iconic Jeep seven-slot grille, flanked by round, high intensity headlamps. This is more than just a grocery getter, as seen by the short front and rear overhangs, allowing the 2018 Jeep Renegade to mount and climb steep obstacles, while the high ground clearance allows for unstoppable performance in snow and water fording up to 19 inches. Inside, off-road capability meets urban practicality, with your choice of several interior options. Up above, meanwhile the available MySky sunroof with dual removable panels lets in the great outdoors in seconds. TRAIL-RATED POWERTRAIN OPTIONS: Whether you’re out on the trail or cruising around town, power and capability are everything, and the 2018 Jeep Renegade offers one of the most advanced and economical slates of engine offerings ever. For those looking for ultimate gasoline economy, choose the 1.0-liter four-cylinder, producing 120 horsepower, or the 1.3-liter four cylinder, with 180 hp. 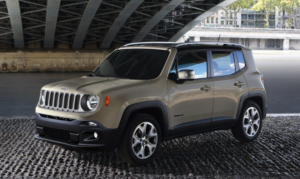 If you’re looking for the unbeatable torque, longevity and fuel mileage only today’s modern diesel engines can offer, you’re in luck there, too, because the 2018 Jeep Renegade offers two diesels: a 1.6-liter diesel with 120 horsepower, or the larger and more powerful 2.0-liter diesel with 170 horsepower on tap. Backing up any of those engine choices is your choice of either a smooth-shifting six-speed manual transmission, a seven-speed dual clutch transmission, or a nine-speed automatic transmission. LEGENDARY JEEP CAPABILITY: Since the beginning of the brand, unstoppable capability has been in the job description for every Jeep built, from the Willys Jeeps that helped win World War II, to the millions of postal Jeeps that helped the U.S. Mail find its way through snow, rain and gloom of night. Carrying on that great legacy is the 2018 Jeep Renegade, featuring a crawl ratio of 20:1, suspension travel of up to 7.5 inches, and nine inches of ground clearance. For the ultimate in off-road capability in a 2018 Jeep Renegade, check out the 2018 Jeep Renegade Trailhawk edition. Packed with the best and toughest running gear found on any Renegade, a factory lift and knobby, all-terrain tires, the 2018 Jeep Renegade Trailhawk is an off-road beast that can take you far out past where the sidewalks end to choose your own path. Whether you’re looking for a cool, modern cruiser or a capable off-road machine to get you and your gear to the backcountry, there’s a 2018 Jeep Renegade for that, at a price that you might not expect from a vehicle packed with so much capability, power and features. If you’re looking to buy a 2018 Jeep Renegade in Rogers, Arkansas, stop in today and talk to our friendly sales associates at McLarty Daniel CDJRF in Springdale. We’re anxiously awaiting the arrival of the newly updated 2018 Jeep Renegade models, and we can put you in the driver’s seat of one as soon as they come off the transports. Come see us, or shop our big selection of Jeep Renegade models online right now. Click here to contact McLarty Daniel CDJRF, or click here to browse our full Jeep lineup.